Grading is the bane of my teaching existence. It seems there are always piles just waiting to be graded all the time. I can see it now, clear as crystal. My students have just gone home and I return to my classroom at the end of the day to find huge, overflowing stacks of papers seemingly everywhere. They are toppling off of the turn in bins, piled on the small group table, and scattered across the floor. It has never been more tempting to scoop them all up and place them in the safety of the recycling bin. Seem familiar? I have encountered this scene more times than I care to admit, but it seems no matter how much I tried to stay on top of grading it always caught up to me. Not going to lie. There were a few items that did happen to end up in the recycling bin, but that wasn’t truly an answer. Instead I slowly had to figure out smart strategies that would keep the papers from piling up, and me from going insane. 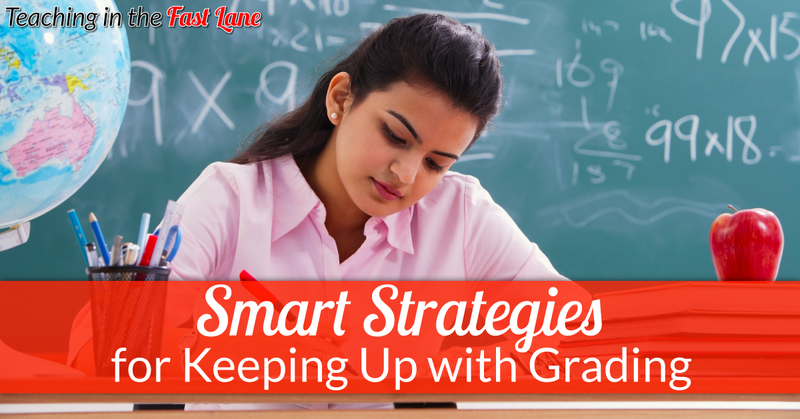 These strategies helped to tame the grading beast, allowed me to offer more prompt feedback to my students, and helped our classroom be a little less flammable. ? There is a lot of practice that goes on in the classroom, and when you ask yourself if you should be grading practice I hope that your answer is no. When we work with our students we are helping them to build mastery and don’t want to assess every single thing they do. This can be detrimental to our students’ self esteem as well as our workload. When it comes to practice allow students to check their work informally with you, a partner, or an answer key. This doesn’t mean that you don’t “look over” their work, you just don’t formally grade it. When it comes time to collect a grade on a concept collect those papers and grade them as soon as possible. This means that instead of a week’s worth of practice and then an assessment, you just have the single assessment to grade. This cuts WAY back on the amount of grading and allows you to get it done more quickly providing prompt feedback to your students. This also provides you with the data you need to build small groups for reteach. There are new apps, Chrome extensions, and other items being released every day to make our lives a little easier. Take advantage of these items! In this post I detail how I used Google Forms to collect answers from students using task cards. This could be adapted to just about any item that students complete. After I wrote this post I was introduced to Flubaroo, that actually checks the answers for you! Woo hoo, mega time saving potential right here! Let’s face it, many of the assessments that we give our students are way too long. You only truly need three questions on a concept to know whether a student has reached mastery or not, so why are we giving assessments that are forty plus questions long over one concept? These lengthy assessments serve as a point of frustration for our students and for us because they don’t want to answer fourteen questions over place value, and we don’t want to grade them. Why not take a look as your assessment and pair it down to what is necessary. I understand that our districts give us assessments that must be completed, and there isn’t a lot that can be done there, but I am talking your own in-class assessments or checks for understanding. Grading never truly bothered me until it became a monstrous task because it piled up. When I would go through the pile and find multiple assignments per subject is when my knees got a little weak. Then I started a new system. After each assignment was turned in I would take a binder clip and clip those papers together. This served a couple of purposes, the first being that when students went to place their next assignment in the tray it wouldn’t get accidentally shoved in with another assignment, and secondly it was a really easy visual for me to glance over and see how many binder clips, and therefore assignments, had accumulated in a given subject area. Along with the binder clip system I tried to make time to grade every day. I set aside about ten minutes a day of uninterrupted time. My preference was to do this first thing in the morning when I got to school. This way, I was able to stay on top of grading instead of having a heaping pile waiting for me. Another way I saved time was by always having grading with me. This was especially useful when it came time for meetings. Participants slowly drift in, and if you are on time you generally have a solid five to ten minutes before the meeting begins. By having a little something with me to grade it kept me from getting antsy and felt like I was accomplishing something. I am NOT, however, proposing that you grade through the entireties of meetings. I know what you are thinking, “Is that even possible?” I am here to tell you that it is. At least more enjoyable than just sitting at your desk making marks on a paper. There are a few ways that I have found to make grading more of an experience that I can live with. The first is smelly markers. I am a big fan of Mr. Sketch because the scent lasts and the colors are vibrant. Their chisel tip is my fave. You can grab your own from my affiliate link. My next tip to enjoying grading is all about your environment. Sometimes at the end of the school day my classroom is the last place on earth I would want to be. On these days a change of scenery could make all the difference. I would take my stack to our library, which had huge windows that let in a lot of natural light. This was an instant mood lifter for me. On particularly heavy grading days I would treat myself to a Blizzard from DQ to get me going. I am not an advocate for grading outside of school because most of the time it just meant it went for a car ride. Which just left me feeling guilty I was not getting it done. From time to time I would go get a pedicure and grade my little heart out while getting pampered. Regardless of how and where you choose to grade, just remember to make it work for you. Don’t wait until the day before grades are due, and don’t overdo it!